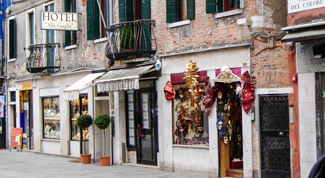 The Hotel Alle Guglie (not to be confused with the Alle Guglie B&B nearby) is a three-star hotel on the Rio Terà Farsetti, the main pedestrian thoroughfare to the east of the Ponte delle Guglie bridge over the Cannaregio Canal. It's an easy walk from the Alilaguna and ACTV water buses at Guglie, and about 800 meters or 1/2 mile from the Santa Lucia railroad station. Walk to the Ponte delle Guglie (a stone bridge that spans the Cannaregio Canal). Turn left at the foot of the bridge. Walk down the wide shopping street. In less than a minute, you'll see the Hotel Alle Guglie on your right. ABOVE: This map shows the route from Venezia Santa Lucia Railroad Station to the Ponte delle Guglie on the Cannaregio Canal. Walking time is 5 to 10 minutes over level ground. Leave the railroad station by the marble steps outside the main doors, or by the side exit near Track 1 if you have rolling luggage, a stroller, or a wheelchair and want to avoid stairs. When you reach the wide fondamenta or pavement in front of the station, turn left. Walk past the Scalzi Church and the Scalzi Bridge toward the Rio Terà Lista di Spagna (a busy shopping street). Continue down the Lista di Spagna and through the Campo San Geremia to the Ponte delle Guglie, which is a stone bridge over the Cannaregio Canal. Continue straight ahead on the wide shopping street. In less than a minute, you'll see the Hotel Alle Guglie on your right.